When it comes to automotive lifts, the one misconception is that all lifts need to be bolted to the floor. That statement is correct for all 2-post lifts and most of the four-post lifts you encounter. 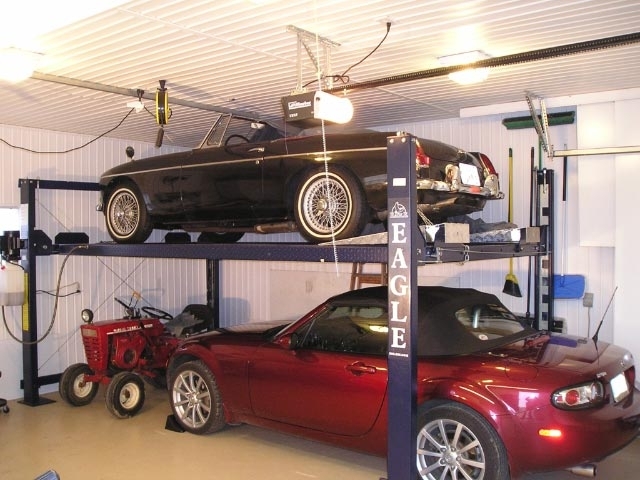 There are some mobile car lifts from Eagle that do not have to be fixed to the floor but offer the ability of the end user to lift their vehicles: the PMR-6000-48 mid-rise scissor lift, the MS-8000 series 4-post storage/service lift and the MOBILEMAN® single-post mobile car lift. Let me tell you a bit about each style. The Mid-Rise Scissor Lift is a mobile car lift that has been a part of Eagle’s equipment line for nearly 20 years. It is a 6,000 lb. capacity, scissor-style lift, with a 48” rise and can go up to 54″ with the height adapters (that come free). Starting at 12”, there is a locking position every 4 inches. To load, it sits flat on the floor, and you drive the vehicle over the top of the lift. Each arm is adjustable, which allows you to move them to the correct load points for specific vehicles. The twin hydraulic cylinders and scissor lift design give this lift extreme strength and solid stability. One end of the scissor design has two steel rollers attached to each end of the scissor. These roll during the lifting process, allowing the lift to rise. The steel rollers also work with moving the lift around. The lift comes with a dolly that picks up from one end of the lift, opposite of the steel rollers, and lets you push or pull the lift around your shop or garage. On the opposite side of the scissor, there is a 3″ diameter steel rod that sits still during the lifting process. This steel rod is the anchor that steadies the lift during the lifting process. When the vehicle is loaded on the lift, most of the vehicle’s underside is not accessible because of the design of the lift. 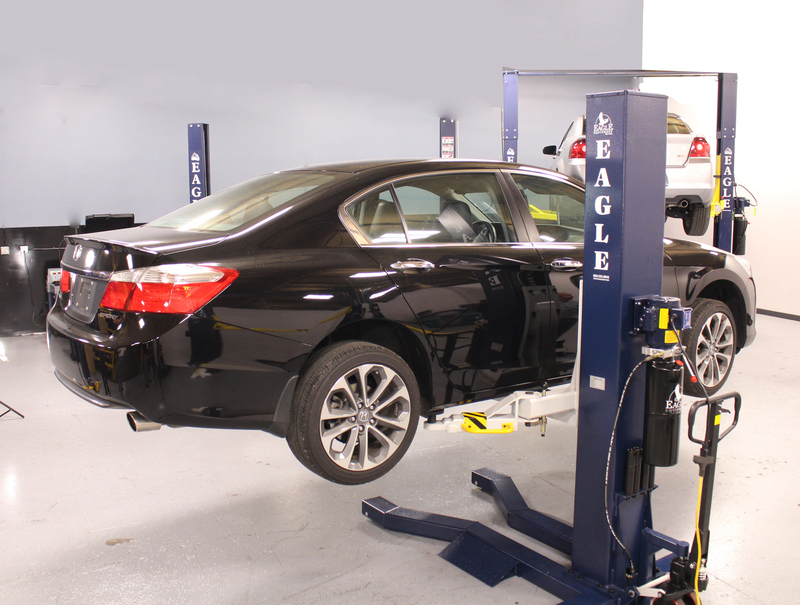 This lift is best suited for tire and brake service, bodywork, and light auto repair. By far one of our most popular lifts, mainly sold to the residential and non-commercial market. It can be used in most commercial applications as well. This lift is a cable-over-hydraulic system and operates with a 110-volt or 220-volt power unit. This lift allows the end user to bolt the lift to the floor if they wish, but is also designed to be free standing. The MS-8000 is our standard version. It is 168″ long and rises to 72″. It has 10 different locking positions. The MS-8000XLT is our “extra” version of the same lift. “Extra Long” at 185″ long and “Extra” rise up to 82″. It also has an “extra” 2 locking positions, for a total of 12. This lift is offset on the base plates, which allows the plates to each maximize their load and stabilize the lift, without being bolted to the floor. If you need to move the lift and use a little more of your floor space, a caster kit is included with the purchase, allowing you to do this. Simply attach one caster assembly to each post and lower the lift. The weight of the lift will start the caster kit system and pick up each post onto the wheel itself. One person can move the lift once it is securely on the casters. Also included with the purchase are 3 drip trays, 1 jack tray and a set of aluminum drive-on ramps. 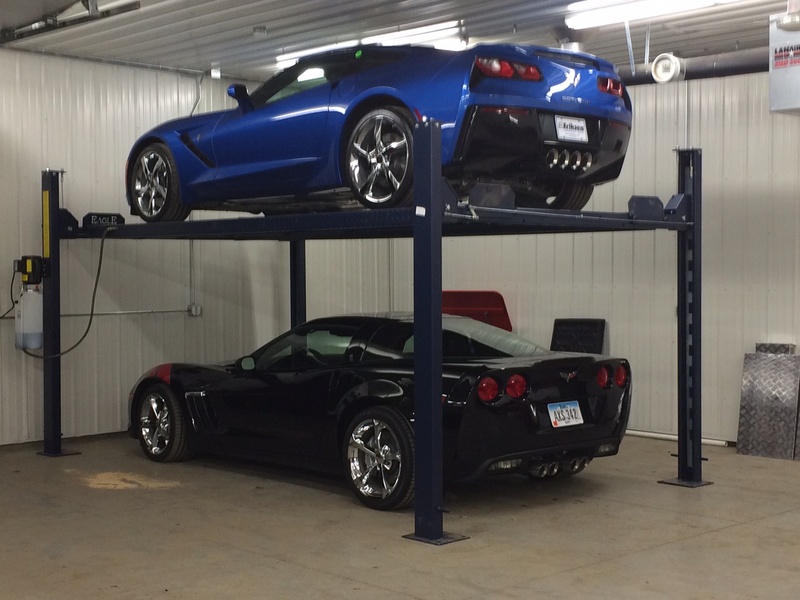 This is lift is best designed for storing 2 vehicles and/or automotive repair. Primary users – Automotive repair shops, body shops, restoration shops and residential uses. This single post, 6000 lb portable lift, is designed to operate like a pallet jack, with the ability to lift vehicles to a height of 72″. It’s called a MOBILEMAN® because of it’s mobility around a shop with ease. The versatility of this lift, its ability to be moved quickly and how easy it is to store out of the way makes this a very big seller for Eagle Equipment. Loading the vehicle is easy when you maneuver the MOBILEMAN® under the side of the vehicle, or simply driving the vehicle over the ramps. This lift uses 4 arms that are adjustable and allow the user to reach each of the vehicles load points. This lift has 12 different locking positions starting at 12” off the ground. A single post lift is attached to a very beefy pallet jack-style base. It is capable of lifting most cars, with a capacity up to 6000lbs. The MOBILEMAN® is a chain-over-hydraulic system that operates using a 110-volt Eagle power unit and comes with 3 sets of height adapters. This lift is best suited for auto repair and body repair. The MOBILEMAN® can also be used by the homeowner because of its versatility and the ability to be moved and stored out of the way. These are all moveable and portable lifts. For more information on the lifts listed above, or maybe a different style of lift, please check out our website – www.eagleequip.com or call us at 1-800-336-2776 to speak with one of our Customer Care Team Members. Previous Previous post: Is the MOBILEMAN® Single-Column Lift right for you?